NEW YORK (CNNMoney) -- China's red-hot economy has led to an explosion of millionaires who are ready and willing to spend on high-end brands like Louis Vuitton and Audi. And that's good news for investors who are looking to jump on the luxury bandwagon. 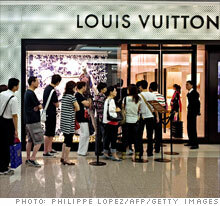 Shoppers wait their turn to enter a Louis Vuitton shop in Shanghai. "If you look at the footprints of high-end European brands within Asia, they tend to be relatively small, but growing very quickly," said Jason White, a portfolio specialist for the T. Rowe Price Overseas Stock Fund (TROSX), which holds shares of Cartier jewelry-maker Compagnie Financière Richemont (CFR, Switzerland and Audi-maker Volkswagen (VOW, Frankfurt). White added that sales of BMW (BMW, Frankfurt) and Mercedes-maker Daimler (DAI, Frankfurt) are also surging in China. Over the past decade, there's been a 50% increase in the number of Chinese millionaires, with most of them under 40 years old, according to CLSA Asia-Pacific Markets. And they love the glitz and glam: donning Louis Vuitton handbags and Richemont watches, sipping Dom Pérignon champagne, and cruising around in Audis. "Chinese consumers have buoyed and kept the luxury markets around the world solvent," said Shaun Rein, Shanghai-based managing director of the China Market Research Group. In addition to clamoring for designer goods at stores in Shanghai, Beijing and Hong Kong, Chinese tourists have dominated sales at flagship locations on New York's Fifth Avenue and throughout Europe, where the goods are about 30% cheaper than they are on mainland China. A Louis Vuitton boutique in London was recently forced to limit shoppers to three purchases to make sure they would have enough left, said Kirk Cheyfitz, CEO of global marketing agency Story Worldwide, at the Bloomberg China Investment Strategies conference earlier this month. CLSA forecasts that China will become the world's largest market for luxury goods over the course of the next decade, accounting for 44% of global sales by 2020, from 15% today. Though they do take a hit during economic downturns, Magoon Capital Chief Executive Christian Magoon said the luxury brand companies are still sound investments. "Luxury brand companies are solid investments over the long term because it's very difficult for new players to enter the space," Magoon said. "These brands have tradition and status that makes them unique and gives them the ability to price things as high as they want." Chinese buyers are Louis Vuitton's biggest customers already, according to CLSA, and sales will likely keep growing alongside an increase in the number of Chinese millionaires. And demand for luxury goods is likely to pick up even more steam if the Chinese government allows the yuan to appreciate, which would make imports like Louis Vuitton bags less expensive. "A rising yuan would give the Chinese much more buying power," said Jonathan Masse, senior portfolio manager of AlphaShares, the fund management company co-founded by Princeton University economist Burton Malkiel, who also authored From Wall Street to the Great Wall: How Investors Can Profit from China's Booming Economy. 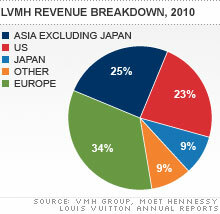 LVMH Moet Hennessy Louis Vuitton (LVMH, Paris), the world's largest luxury goods groups with its 60 brands including its namesakes, Tag Heur and Fendi, is one of the biggest holdings in AlphaShares' global China-linked portfolio. Prada may be the next hot buy. Last month, the Italian fashion house announced plans to list its shares on the Hong Kong stock exchange as it looks to expand its international business.